Thread: What's your OS & system language? hi, folks. given that CA is so multinational, i thought it'd be helpful to informally poll the members about some of their comp system details, to help me plan how to best distribute a digital calendar applet featuring CA members' art (see this TD thread for details). i'm using progamming software that is cross-platform, but each type of system has its own peculiarities and "special needs." system language is a factor also for some systems that don't play well with Unicode (essential for foreign language systems). so, what Operating System do you use, and what language does your 'puter speak? i'd set up a poll thread for this but i don't know enough about the range of possibilities to set up the poll selections intelligently. I had this dream which involved a super fast station where I could render 3d images with lightning speed. One station where I could have everything on it. Very very nice but hardly anything works on it... my Canon scanner isnt compatible so I e mailed them to know if they intended to eventually offer drivers for X64 and they told me: " X64 is a very powerful station and we only have drivers for ONE model of scanner and we dont intend yet to produce drivers for the model you have..."
but, yes, it is fast... very fast !! 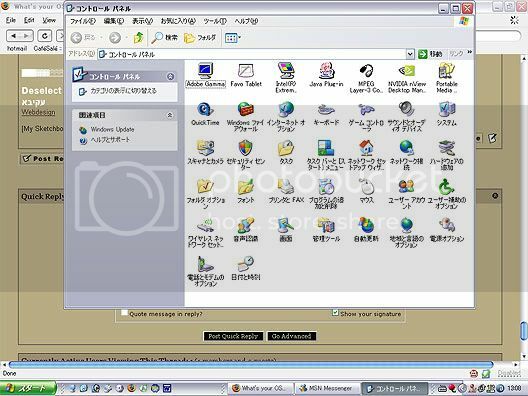 Windows Vista x64 in English. good god i want an intel mac...i mean bootcamp is insane. I hate this comp. english on one and norwegian on the other. OS X 10.4.5 going to 10.4.6 on the Quad. Engrish. Last edited by Ilaekae; April 21st, 2006 at 05:23 PM. Reason: addition. Last edited by tongue-fu; April 27th, 2006 at 02:32 AM. OS 10.4.6 and Win2000 SP2 - both german. But I&#180;m planning to get XP to get my old Black Isle titles going. I also used to run SuSE, but tossed it for many reasons.